Happy (Black) Friday! If you're brave enough to wrestle over sales and power through the crowds today, then more power to you. B and I on the other hand will be doing our second family meal today, drinking copious amounts (um what else does one do at family gatherings?) and playing board games. I hope you've had a fabulous holiday and if you're looking for Black Friday deals, why not pop by the shop and take advantage of free domestic shipping on all orders? I want B and my initials on this sweet pendant. This ring is timeless and made of quality materials. 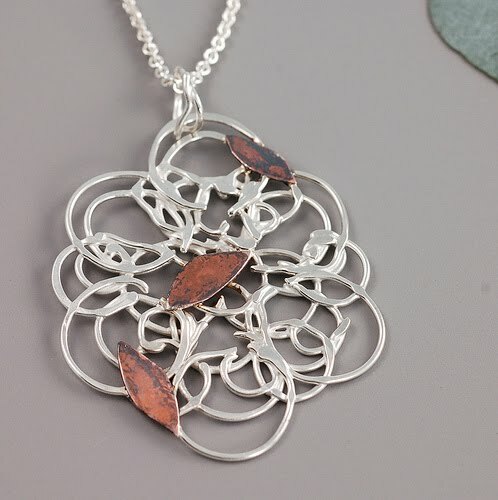 Beth is offering this gorgeous pendant made from fused argentium sterling silver and copper on a sterling chain. The pendant is approximately 2" long and 1 1/4" wide. It's simply beautiful. This is the type of piece that surpasses trends and would look good on just about anyone so if you don't keep it for yourself, it would make an amazing gift. 1. Visit Beth's shop and tell me what you like. Do you have a favorite item? 3. Blog, Tweet, or Facebook about this giveaway and let me know you did! Make sure to leave a SEPARATE comment or it won't count (3rd entry). Winner will be picked 12/1/09 in the p.m. Good Luck!!! Ooo I love all of Beth's pieces — but this one would be great as a gift for my friend who is getting married, and her engagement ring band has the texture of park around it. SO pretty! And-Happy Thanksgiving Christina. I'm a follower! I love Beth. This is beautiful. Ah! She's one of my favorites! I get compliments on her earrings all the time. The tree bark pendant is adorable! love the organic vine earrings! have a beautiful weekend! Beth makes such beautiful jewelry! I think the constellation pendants would make such a lovely, unique gift! I love beth's stuff...she made my wedding rings! P.S, I'll be honest and say I wasn't a follower before....but now I will be! 14k Palladium White Gold Women's 4mm Tree Bark Wedding Ring - even though I have no plans to marry at the moment - I think it's still drop dead gorgeous!! love love love custom tree bark of love. It's perfection! Oh and I'm already a follower! Beth has so many gorgeous items to choose from but I am really loving the initials pendant. So unique! ooooooh! she has some great stuff! i love the simple hammered earrings -- the hoops and the ovals. beautiful! hope you are enjoying your day. cheers! I love the Organic Vine Earrings - small with garnet - argentium sterling silver! I really like the Organic Vine Ring with Sodalite. Lovely work. STERLING BANGLES! I love them. I've loved them from day one. Someday, they will dance on my wrist. The tree bark and giveaway pendant is gorgeous! I also love the Custom Constellation Pendants and the Organic Vine Ring with Chalcedony. Such beautiful pieces! Christina, I hope you had a remarkable Thanksgiving!! Beth has so many beautiful pieces, its hard to point to a favorite. But, I really love the Organic Vine Necklace! I did a facebook message for your giveaway!! Im a follower! great giveaway! I really like the Organic Vine Earrings - small with amber - argentium sterling silver!!! i have the love knot tree bark ring on my favourites list for ages. Beth does beautiful work! I love the initials on the tree. And I just twittered about the giveaway. in white gold or silver are my favorites! Wonderful giveaway and such gorgeous designs! I adore her Custom Constellation Pendants... such a smart idea... looks very simple yet with so much meaning. Love love it. I like Custom Constellation Pendant. I love them all! Especially the ring! And I'm a follower! oh wow! so hard to pick from those beauties. i think the flower ring and the ring you picked out above would be my favorites. I <3 the Custom Tree Bark Charm...how ADORABLE!!! My fav is def the bark with the initials, how cute! 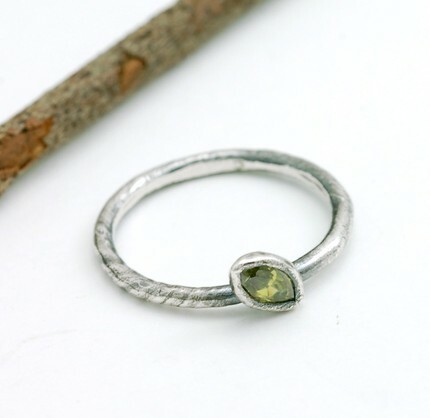 i love the Vine and Leaf Ring; its simply beautiful! I love the organic sterling bangles and the amazing flower ring! love love love love love the tree bark of love pendant!!!! I love a lot of the pieces in her shop but I adore the tree bark ring. It's so, so beautiful. Great giveaway!!! I love especially the necklaces, constellations and tree are my favourite and I also love the one for this giveaway!!! Love the tree bark necklace! I love the organic vine necklace:) Thanks! I love the organic vine rings and the lotus T-shirt! LOVE the tree bark pendant with the initials! Sooooo sweet. My favorites are the organic sterling bangles - but all of her thin bangles are beautiful! I love this item! So pretty! Loved the garnet and gold lunar landscape pendant/ necklace! Also a fan of the tree bark wedding bands... and the simple "subtlety" bands! Love the organic vine earrings- so pretty! I'm with you on the custom tree pendant, I love it!!! My favorite item of Beth's I actually own already. I have the Simple Hammered Ovals (earings). They are so simple yet beautiful. I get compliments on them every time I wear them! WOW- her jewelery is amazing- how can I choose a favourite? It's hard to pick one favorite, but I love Beth's One Wish - Single Seed Fluff Dandelion Set in Sterling Silver! Oops, I forgot to put this in a separate entry. I visited Beth's store and I must say I'm in love with the "Garnet and Gold Lunar Landscape" pendant necklace made out of sterling and 14k gold". I'm in LOVE with the tree bark of love pendant! Our initials are C.C. & B.B. How cool! I'm a follower~ great to find this place! I love the organic vine necklace! It has been tweeted too! That bark necklace is unbelievable! I love love love it! I love the Tree Bark and Leaf ring - so unique! The pendant she is giving away is absolutely gorgeous as well, its definitely one of my favorite items in her store. I think my favorite is the simple hammered silver earrings. But the pendant is gorgeous as well! Man, Beth's pieces are all amazing and I love all of them. But, I'm still a big fan of the organic & simple stacker rings the most! I have several of Beth's creations and really can't pick an absolute favorite; however, I have the earrings that would match this necklace perfectly! oooh, so hard to choose! all of them!! Yes, I'm a follower via RSS! i'm in love with that first necklace/pendant. amazing. Great giveaway! Everything is really pretty but I'm in love with the Custom Tree Bark of Love Pendant, it's so unique! Love all of the the tree bark rings and pendant, and the copper and silver pendant is stunning! I'm (finally) a follower too! Better watch out, Athens, I'm about to get WAY cuter. I love Beth's tree bark wedding bands. 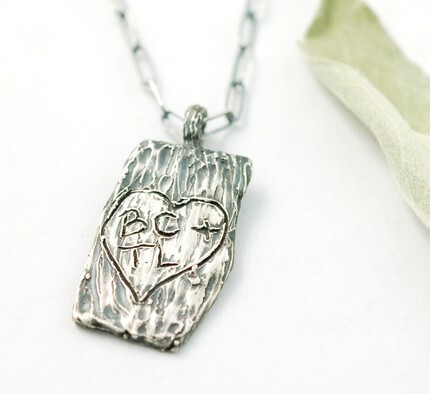 I'm a follower and LOVE the Custom Tree Bark of Love Pendant! Such a sweet idea! Oh, I love so many of the pieces! I just love the organic feel of it all. Any of the silver earrings would quickly bc everyday staples in my wardrobe. So cool.